Beautifully cooked artichokes in under 30 minutes! Spring brings new bounty in the produce department, including the arrival of fresh artichokes. March through May marks peak artichoke season and we are even more excited this year. 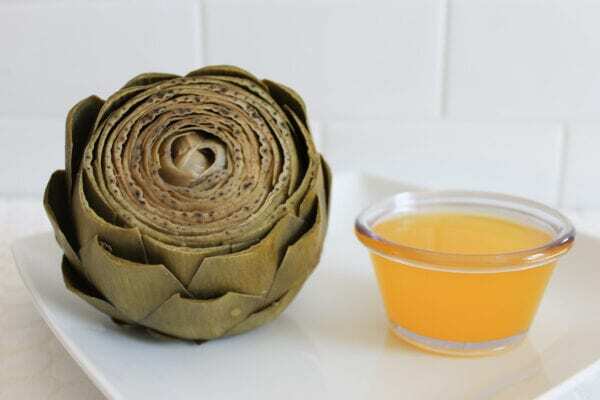 After some trial and error, we have found the easiest, fastest way to prepare artichokes. So bring on the chokes… we’re ready for a spring feast! Many people avoid fresh artichokes because they find them intimidating. But it’s really not hard to prepare them once you know what to do. With the assistance of an Instant Pot, you can have perfectly cooked artichokes in under 30 minutes. Read on to learn how to steam artichokes and sauté the hearts using just your Instant Pot. In the past, the slow cooker was our most recommended way to prepare artichokes. This is still a great option if you want to set it and forget it. But sometimes it’s difficult to remember to plan ahead. And other times you don’t want to wait 4 hours when you’re craving artichokes right now! The Instant Pot allows you to prepare artichokes on a whim, whenever the craving hits. Let’s talk ingredients first. One of the best things about artichokes is that they have such great flavor, you don’t need a lot of other ingredients to make them delicious. A little garlic, some lemon, and a butter-dipping sauce are really all you need. Produce Mom Tip: Select artichokes that have tightly packed, dense petals. The first step to cooking artichokes in the Instant Pot is to trim off most of the stems and remove about 1 inch off the tops. Rub each artichoke completely with one of the lemon wedges to prevent browning. Go ahead and trim and peel a few cloves of garlic. Now that everything is prepped, it’s time to get cooking! Add 1 cup of water to your Instant Pot and place your steamer basket or trivet inside. Arrange 3 artichokes stem-side-up inside the Instant Pot along with 2 lemon wedges and 2 whole garlic cloves. Place the lid on the Instant Pot and set it to Manual with the timer set to 10-15 minutes depending on the size of your artichokes (bigger artichokes = more time). After the timer goes off, release the pressure and then remove the lid. You’ll know they are fully cooked with the stem can easily be pierced with a fork. Let the artichokes cool for a few minutes and then gently remove them with tongs. Plate them alongside your garlic dipping butter and enjoy! Not sure how to eat an artichoke? That’s ok … you’re not alone! Rather than trying to slice right into a whole one with a knife, the way to eat an artichoke is to peel it apart petal by petal. Enjoy the stem-side of the petal by skimming the flesh lightly with your teeth. For inner petals, you may be able to eat the entire thing, especially when prepared using an Instant Pot. Sautéd artichoke hearts are a delicacy, whether they come from a jar or from a fresh choke. In our instance, we already had several hearts steamed and ready, so we’ll be using fresh ones. We’ll be using the Instant Pot to sauté but you could use a regular skillet or sauté pan on the stove. You’ll first need to remove all the petals and remove the choke from the center. The easiest way to do this is to slice the artichokes lengthwise and carve out the choke with a butter knife or spoon. The fuzzy center of the artichoke may look inviting but it’s inedible! The artichoke half on the right side has had its choke removed. The left side still has its choke intact. Add 1 tablespoon of butter or olive oil to the Instant Pot and set it to Sauté. Add chopped garlic and cook for 1 minute, stirring constantly. The garlic will infuse the butter with rich garlic flavor. When the minute is up, add the artichoke hearts and cook for another 5 minutes, stirring occasionally. The hearts should brown slightly around the edges. Sprinkle lightly with sea salt and serve these artichoke hearts as a side dish. They offer a mild, nutty flavor akin to broccoli or asparagus. A delicacy like this fits right in on special occasions, like Easter dinner. Trim most of the stem and about 1" off the top of each artichoke. Remove the lower petals by peeling them away with your hand. Rub each artichoke with one of the lemon wedges to prevent browning from occurring. Don't forget to rub the cut stem too. Add 1 cup of water to the bottom of your Instant Pot. Arrange artichokes (stem side up) in your steamer basket or trivet. Place the lid on the Instant Pot and make sure the release valve is in the sealed position. Set the Instant Pot to Manual with a time between 10-15 minutes. 10 minutes for very small artichokes, 15 minutes for very large ones. At the end of the cooking process, release the pressure. Allow to cool for a few minutes before removing gently with tongs. Add the butter to the Instant Pot and turn it to the sauté setting. Add artichoke hearts and cook for an additional 5 minutes (or until lightly browned), stirring occasionally. Add butter to a small sauce pan to melt over low heat. Add lemon juice and garlic powder and stir gently to combine. What’s your preferred method for cooking artichokes? Try cooking them in an Instant Pot and see what you think. We hope you love this quick and easy method as much as we do. If you love tender, tasty artichokes then we know you will!